Where was the connection to pilots? I always believed that creating Sugar Labs as a home for the Sugar community presented a huge opportunity. Yet despite the obvious efforts made by the Sugar community, many great discussions on the It's an education project mailing-list and the dedication by a whole bunch of very smart people I wasn't sure whether things were actually moving into the right direction. The direction, in my humble opinion, should be a clear path to making Sugar a hardware-independent platform to facilitate learning learning for children, especially in developing nations. The main issue I saw was the ridiculous disconnect between pilots / deployments, schools / teachers and the people actually working on, contributing to and discussing Sugar as a learning platform. And what was even worse, I hardly saw any efforts to address this enormous pitfall. To sum up: I was really worried that Sugar would turn into just-another-open-source-project, full of a good intentions, supported by a community of smart and dedicated people but ultimately never reaching its full potential due to lackluster execution. Now, why the change of mind? A weekend spent in Brussels. Those who saw this forum-thread or follow olpcnews or myself on Twitter will know that earlier this month I spent a weekend in Brussels at the FOSDEM'09 Linux conference. I really didn't care too much about FOSDEM'09 itself but rather about having the chance to hang out with some of the core Sugar folks and other European Sugar community members. To say it was an awesome and inspiring experience would be quite the understatement. For the first time in many months I got the feeling that many of the things that have been going on within the community are slowly coming together to create something bigger: Sugar Learning Platform. I feel that many discussions surrounding OLPC and Sugar are overly technical (and therefore often disregarding educational matters), totally detached from realities on the ground in developing nations (and therefore quite irrelevant if you consider that as the main target as I do), or filled with buzzwords (outreach, structure, learning learning and my latest "favorite": irc logs). However that weekend was different. The large majority of the discussions focused on how to make Sugar a better platform for learning and how to gather feedback from pilots and deployments so future iterations of Sugar can address them. As an example let me mention the presentation given by Red Hat's Greg DeKonigsberg which took place in the Fedora room and hardly mentioned Fedora, or any other particular technology or software for that matter. Rather the most frequently used terms were learning, teacher, school, assessment, lesson and curriculum. On a more personal level what I've been inspired by for quite some time now is the concept of participatory design that's commonly used in urban planning projects. Unfortunately many people in software engineering have never heard of such an approach. Even worse is the wide-spread mindset of "people don't really know what they want when it comes to software" when any serious attempt to talk to them (in this case teachers and children) will without a doubt result in interesting and relevant feedback (point in case). Give the Sugar developers and larger community a chance to hear your voice. Create a central place where people who want to contribute to Sugar can go to see what kind of work is needed and welcome to be done without having to dig through a million wiki-pages, mailing-list threads or Trac entries. So what this process will hopefully be is an interface between teachers / deployments / learning / reality and people who are passionate about turning this feedback into 0s and 1s. This presents a unique chance to make Sugar a learning platform for people instead of a learning platform as envisioned by software developers. If this succeeds Sugar's future shall be sweet. I think Sugar should be stable and polished. And should be much leaner on resources than it currently it. Sugar makes KDE 4.0 look as polished as Mac OS Leopard. And as far as "polish" is concerned: Sugar is cutting edge on so many levels that I'll consider it the best solution until someone else shows me something similar (and more polished). My experience with Sugar is limited to running the VMWare image as I believe that's supposed to be the closest to the real environment as you can get. And it performs poorly. Running on a Turion64X2 1.9Ghz system it should perform a lot faster than the XO. Boot time is slow but it isn't on fully native hardware, so I can let that pass. Applications take a long time to load. Even calculator. Calculator in Windows loads within a second, even on a bogged down system. Memory consumption isn't amazing. It's no better than Windows XP. This is a system with 256MB of RAM and no swap file. It is running: Graphics program, Word 2007, Excel 2007, PDF viewer, Internet Exploder. All with documents open, and there's still free memory. Trying to run comparable programs in Sugar is a struggle. Using Write the system became non-responsive and started thrashing the Disk. 7MB/s Disk IO for about 10 minutes before control resumed. WTF was it doing? I really like SoaS, but I realize that is generating a predicament. Will not really run on the XO. Is way too “heavy” for it. Which means it can only run in better more expensive and power hungry machines. Certainly NOT “developing country” machines. Which means that Sugar is becoming a 1st world “desktop” and has to compete with GNOME/KDE/XFCE/Windows/MacOSX on the same machine. So it MUST really become better than these to put a foot in. Now, being “integrated” with Fedora is unlikely for this to happen since the Fedora organization priorities, are clearly different. 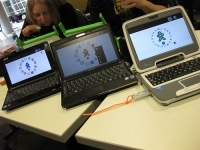 The SoaS approach also means that 1:1 computing is not very likely using the school or home machines. Sugar on a stick may not run well on the X0-1, but regular installed Sugar still does, so the XO-1 is not an orphan. As for the developing world, this year many oems are going to be manufacturing sub-$200 netbooks based on the ARM architecture. These will have around 1 Ghz, and be able to run SOAS just fine. Funny, I just returned from a different conference in Amsterdam (Institute of Network Culture's Wintercamp) with other good news. FLOSS Manuals has taken the opportunity of Wintercamp to have a reorganization and to reach out to others in need of books about Free Software products and their uses. In particular, I was explaining about the opportunities that the XO opens up for Digital Textbooks, bypassing the current bureaucratic acquisition process, and allowing teachers and students to engage in Continuous Improvement of their learning materials. In any language, as well. That's a great problem I see everyday in Uruguay. We have to do a really hard effort to keep information organized, and find ways to give personalized attention to all teachers, so they can express what they need. In Ceibal Jam, our volunteer-develompers group we're working on it. Pablo, please keep us posted on any progress you make in that area!